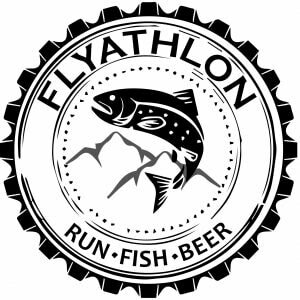 The Flyathlon is a multi-sport event that integrates three activities that are surging in popularity; trailrunning, fly fishing, and craft beer. While many enjoy these activities independently, we have found over the years that putting them together is even more enjoyable. Simply put, many of the best and most beautiful places to fish are way back in the woods, and the quickest way to get back to these remote places to maximize fishing time is to trail run. And once you have run back from that mountain lake or stream (or while you are there…), all of that effort is rewarded with high quality, local craft beer. Giving Back: The overwhelming majority of funds raised by Running Rivers through each Flyathlon event are specifically targeted towards river and trail improvement projects within the greater watersheds in which the individual events are held. By re-investing the dollars that we raise through events into projects to maintain and enhance the trails and creeks that the events are held on, we are ensuring that our activity will be sustainable into the future. Inclusivity: The Flyathlon is designed to be largely inclusive as opposed to truly competitive. To the newbie, both the sports of trail running and fly fishing (and even craft beer, for that matter) can seem very exclusive and even pretentious, and this perception limits their desire to engage in these outdoor activities. The Flyathlon seeks to break down those barriers through accessible events that create positive and fishy outdoor experiences and memories. It is our hope that through this type of exposure, we can create new outdoor advocates, new river warriors. Community Involvement: The Flyathlon actively seeks out local community involvement in our events, and explicitly encourages race participants to spend additional time and money in the host region after each event. Responsible Recreation: The Flyathlon is designed specifically to promote responsible fishing practices and trail habits. On the fishing side of the event, all events are 100% catch-and-release fishing using only fishing methods approved for that specific area, On the trail running side of the event, race rules explicitly highlight proper trail etiquette (e.g. no short-cutting, Leave No Trace principles). If you know you are interested in participating in one of our events, please visit our 2019 Flyathlon Events page for details on how to sign up. If you want to learn more about each of our events, please see the links below. Finally, if you are interested in developing a Flyathlon for the benefit of conservation in your neck of the woods, please contact us and we can explore further!